In fact, they've supported gun rights infringements "since … 1871." gun control legislation since its very inception in 1871." When I recently used the term "NRA-supported" in reference to the National Firearms Act of 1934, some readers asked why I would assert such a thing. They believed NRA had no involvement in gun control politics back then. Because they and others didn’t believe me, I prepared this historical record — to prove my claim and inform others. I agree that blaming today’s NRA management for transgressions of their predecessors is wrong. But confronting NRA management’s longstanding support of gun control is a first step toward understanding that "My NRA" of today views the Second Amendment differently than America’s Founders did — and they have for a very long time. KeepAndBearArms.com — The National Rifle Association has been called "the largest and oldest gun control organization in America" by more than a few gun owners. A fair amount of evidence supports their claim. 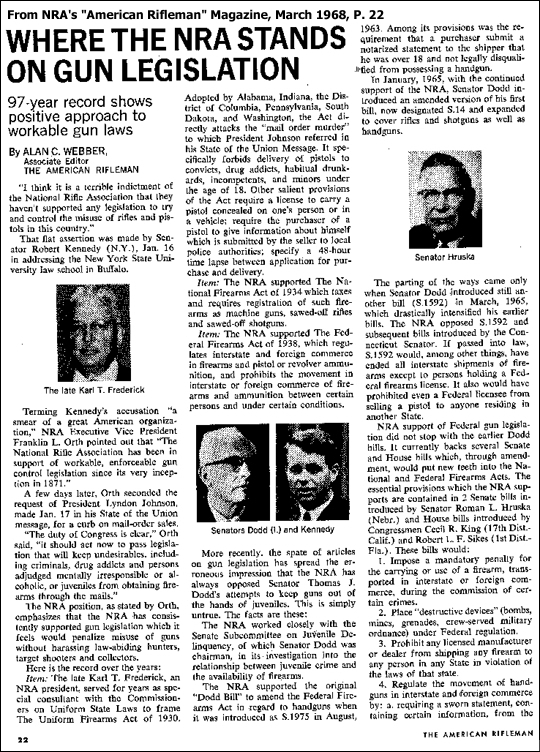 As the Gun Control Act of 1968 was nearing the President’s desk, NRA was being accused by Senator Robert Kennedy (D-NY) of not supporting "any legislation to try and control the misuse of rifles and pistols in this country." Naturally, NRA needed to respond to the allegation, and they responded with great detail and unusual candor. To deflect Senator Kennedy’s assertion, NRA published an article by their magazine’s Associate Editor entitled "WHERE THE NRA STANDS ON GUN LEGISLATION" — elaborating at length about NRA’s longstanding support for a wide variety of gun controls that included gun and gunowner registration, waiting periods, age restrictions, licenses for carrying a firearm or having a firearm in your vehicle, increased penalties for violating gun laws, regulating ammunition and more. 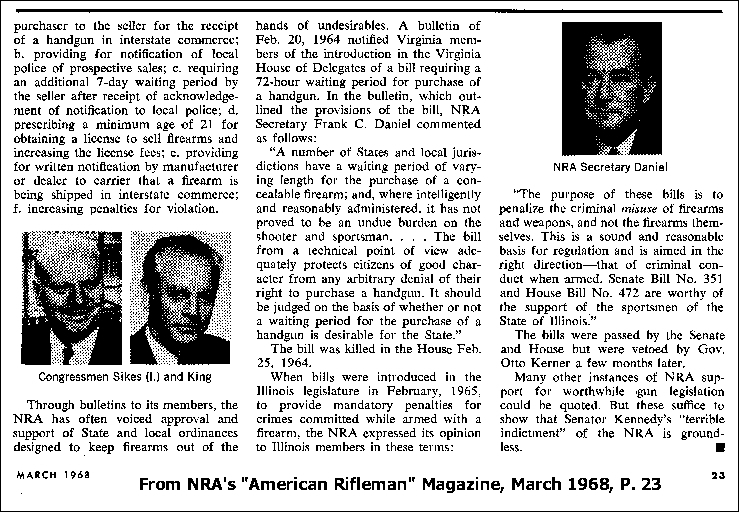 Following are several telling quotes from the March 1968 American Rifleman — NRA’s premier magazine, then and now — and brief analysis of a few of them. The complete article from which these quotes were taken can be found further below. Scanned images of this article are also linked below. Unless someone has evidence to prove that the NRA lied to its membership in its premier magazine, let the record show that the NRA got behind the first unconstitutional federal gun law in America and then bragged about having done so, many years later — decades after the law had been continually used to violate the rights of untold numbers of American citizens, including, surely, their own members. The term "interstate commerce" is the BATF’s fundamental justification for its firearms branch — a "color of law" excuse for the many assaults of innocent people they’ve conducted. That’s one form of registration. That’s an extension of one form of registration to all types of guns not already under registration schemes at the time. That is called Age Discrimination. In essence, in 1968, the NRA was saying "You can go die over in Vietnam for your country at age 18, but you can’t sell a constitutionally protected item to your own neighbors for three more years." "Carrier" includes the U.S. Postal Service — another ripe opportunity for the federal government to collect names of gun buyers. What do you think America’s Founders would say about the NRA calling for "increasing penalties for violation" of unconstitutional gun laws?
" … requir[ing] the purchaser of a pistol to give information about himself which is submitted by the seller to local police authorities … "
Ever heard of a license to carry a firearm in a vehicle? NRA has — over 70 years ago. The "terrible indictment" of NRA, as you will see in the full text below, was that NRA didn’t support gun control. NRA set that matter straight with a loud thud. NRA Management still to this day supports a wide variety of ever-complex gun controls. And despite taking in hundreds of millions of dollars a year, they’ve still never managed a Supreme Court court victory based on the Second Amendment’s historically-valid "individual right" argument. It’s no wonder — their version of the Second Amendment is different from that of America’s Founding Fathers. "We think it’s reasonable to support the federal Gun-Free School Zones Act. … We think it’s reasonable to expect full enforcement of federal firearms laws by the federal government. … That’s why we support Project Exile -- the fierce prosecution of federal gun laws … we think it’s reasonable because it works. … We only support what works and our list is proud." "I think it is a terrible indictment of the National Rifle Association that they haven’t supported any legislation to try and control the misuse of rifles and pistols in this country." Terming Kennedy’s accusation "a smear of a great American organization," NRA Executive Vice President Franklin L. Orth pointed out that "The National Rifle Association has been in support of workable, enforceable gun control legislation since its very inception in 1871." Adopted by Alabama, Indiana, the District of Columbia, Pennsylvania, South Dakota, and Washington, the Act directly attacks the "mail order murder" to which President Johnson referred in his State of the Union Message. It specifically forbids delivery of pistols to convicts, drug addicts, habitual drunkards, incompetents, and minors under the age of 18. Other salient provisions of the Act require a license to carry a pistol concealed on one’s person or in a vehicle; require the purchaser of a pistol to give information about himself which is submitted by the seller to local police authorities; specify a 48-hour time lapse between application for purchase and delivery. "A number of States and local jurisdictions have a waiting period of varying length for the purchase of a concealable firearm; and, where intelligently and reasonably administered, it has not proved to be an undue burden on the shooter and sportsman. … The bill from a technical point of view adequately protects citizens of good character from any arbitrary denial of their right to purchase a handgun. It should be judged on the basis of whether or not a waiting period for the purchase of a handgun is desirable for the State." Many other instances of NRA support for worthwhile gun legislation could be quoted. But these suffice to show that Senator Kennedy’s "terrible indictment" of the NRA is groundless. There are many other documented accounts of NRA management’s support of gun control which can be found at http://www.KeepAndBearArms.com/NRA and http://www.KeepAndBearArms.com/Exile.